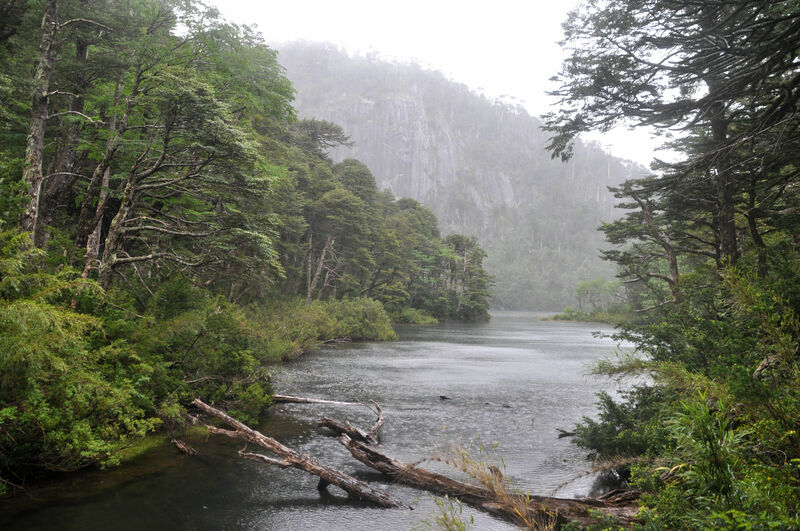 You are currently browsing the tag archive for the ‘Laguna Del Toro’ tag. On the way to the park. 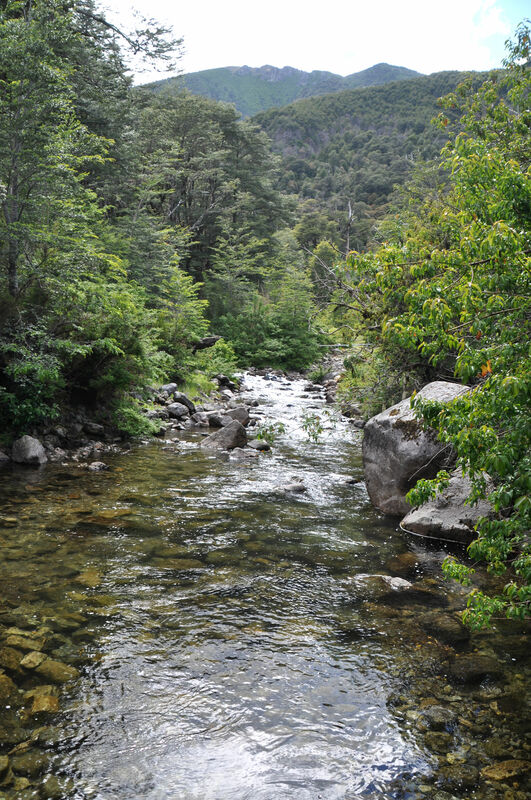 Chile is a stunningly beautiful country. Margaret and I took advantage of our buffet breakfast (included with the room) to collect enough extra goodies for a picnic lunch. The breakfast was awesome, I might add. One table held sliced meats, smoked salmon, and cheeses; the next table was heaped with fresh pineapple, oranges, pears, etc. There was muesli and a whole table filled with different kinds of breads. There were preserves and juices (juice choices were: pineapple, apple cream, and raspberry…uh, ok), coffee and teas. Eggs cooked to order and toasted croissants with ham and cheese. There was another table filled with desserts. FYI, raspberry juice is delicious. We have been calling the common Chilean bread “hockey pucks” because they are of an equal size and density. Ok, maybe a bit of an exaggeration. I will say I’m not a fan of Chilean bread. I wasn’t a fan of Japanese bread either. Maybe I’m just picky about my bread. Anyway, we each nabbed a hockey puck, sliced and spread it with butter and cream cheese, and layered ham, turkey and cheese, then tucked our little sandwiches away into M’s purse, along with a collection of cookies. Viola! Lunch. 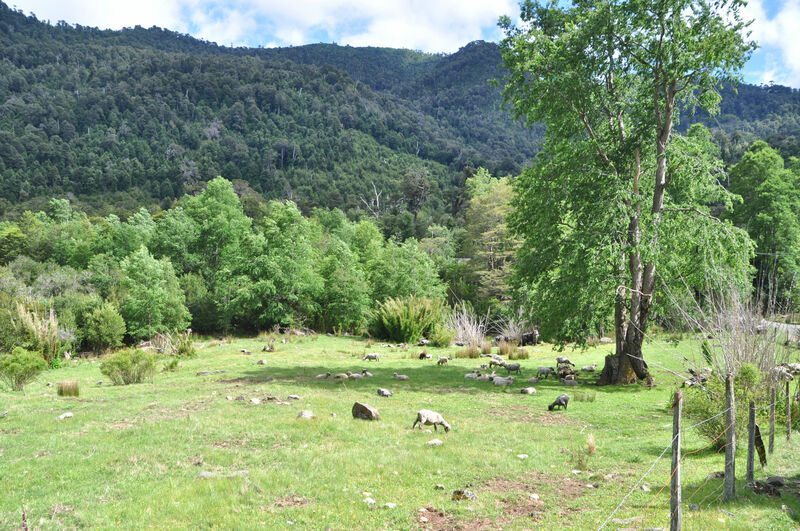 Driving to Pucón this morning was easy-peasy since we did it yesterday and knew the way. The tourist office man had said to follow the signs to Caburgua, and we did. We missed our turn, and ended up at Lago Caburgua. This area was windy and had kicked up a dust storm as the wind raged across the beaches. I did manage to snap a shot in between dust clouds. Lago Caburgua, in between dust clouds. 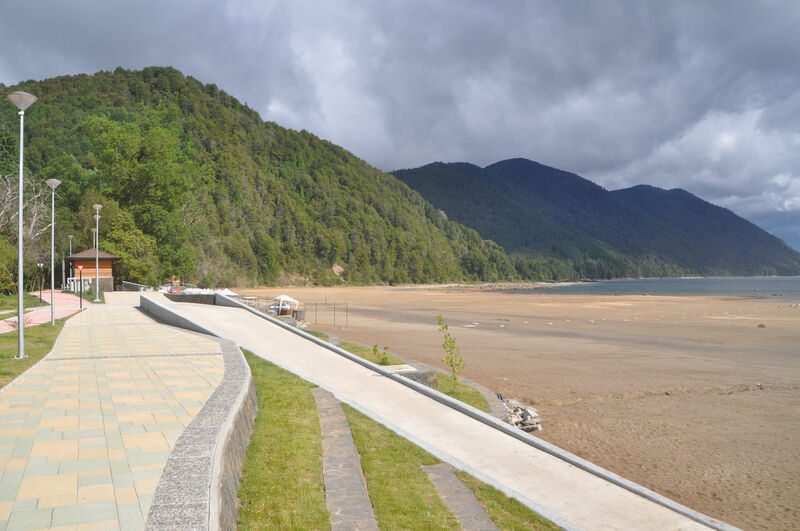 Caburgua is a tiny, nondescript town, and this beautifully built lakeshore wall and walking path was unexpected. Neither of us has working cell phone service in this country, until we get to WiFi, which – blessedly! – has been daily. Ahh, modern life. My phone for some crazy reason, keeps connecting to some kind of service called “moviestar” and I get that when I’m in a city. When moviestar is engaged, I get GPS, but out in the country I have diddly squat. Since I have no idea why I’m getting limited service in Chile, I’m worried that I’m paying for it. Margaret and I both turn our phones to airplane mode as soon as we leave the WiFi areas. Thus we relied entirely on the tourist map we received, and eventually found our way onto a gravel road. Margaret drove us up, up, up into the mountains, dodging potholes and other motorists. There is much wood used in construction here. In so many places, a common construction material is concrete blocks: cheap and quick. Here in Chile, south of Santiago, wealth is displayed in wood. Gorgeous wooden homes and businesses are everywhere, with generous wood decks and wooden arches over driveways and wood carvings and wooden accents. 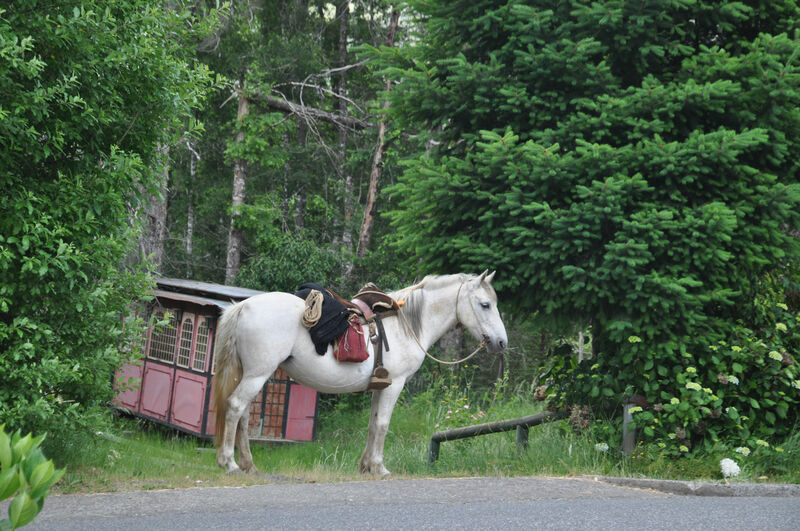 We spotted this great horse, patiently waiting for its master. 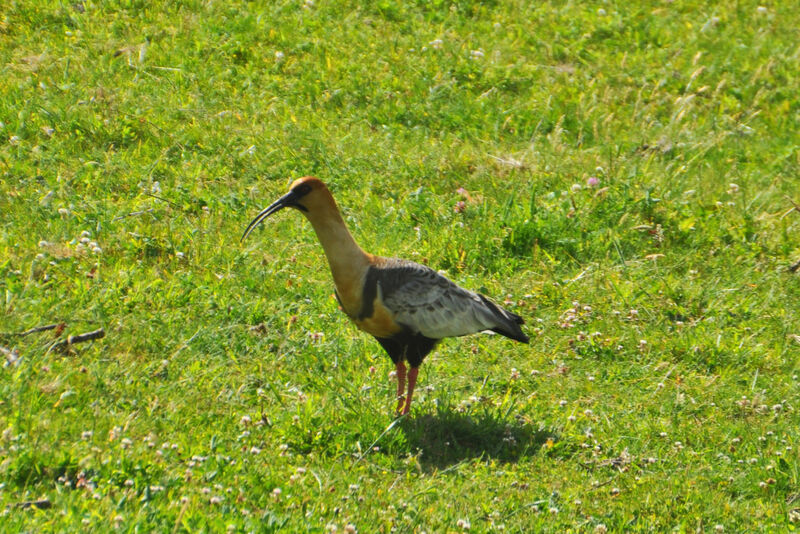 These birds filled the fields, using those awesome beaks to dig for some kind of yumminess in the grass. They have a very loud call that sounds like ducks. This darling little boy was hopeful that we would drop some cookie crumbs. Finally we arrived at the park entrance. Fees were posted outside, and since I had my purse handy, I went inside and Margaret found a place to park the car. I studied Spanish for two semesters at Brandeis, and then immediately forgot everything. So…while I have had a bit of an introduction to the language, it’s most accurate to say I am not at all fluent in Espanol. But after a few days, I’m beginning to get the gist of things. So, I was proud of myself to complete the transaction solo. The Park official asked if we were hiking, and when I agreed, he explained that it’s moderately difficult and it’s 7 kilometers. He explained how much elevation gain and that it typically took 3.5 hours to reach the three lakes. He kept checking in with me “Do you understand? Is that good?” I think he was just making sure we knew what we were getting into. I understood him (entiendo) and asked about the fee, explained that there were two adults, and paid in exact change. He wished us a good hike, gave us a receipt, and we were good to go. The entire conversation was in Spanish. Off we went, and I admit I was giddy with happiness. On vacation in another country AND hiking AND good company. Margaret and I seem to never run out of things to talk about, and we’re both so open to taking on whatever adventure presents itself. So we hit the trail at about 10:30 am at about 2300 feet in elevation. 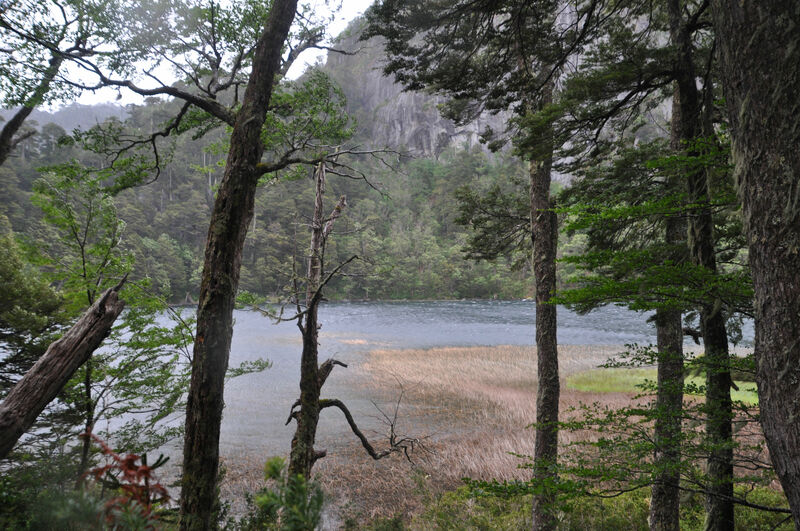 We walked along the shores of Tinquilco Lake and I could never quite get a decent shot because we were in the trees. Both of us remarked on how we did not anticipate seeing so much bamboo. We loved the huge fuchsias growing wild and taller than we are. We liked a tree that had needles like a Yew, and bark that peeled off in puzzle piece shapes. The sun continued to shine and light up the lake (I could see it through the trees), and I crossed my fingers that there would still be sun when we finally broke out of the trees. Interestingly, the trail took us back to a gravel road after a half mile walk, and we were soon strolling past grazing sheep and cute little homes and fenced fields. Scotch broom is in bloom, wild roses, pussywillow, purple and yellow lupine, and foxglove. It’s late spring in Chile and it’s just wonderful. 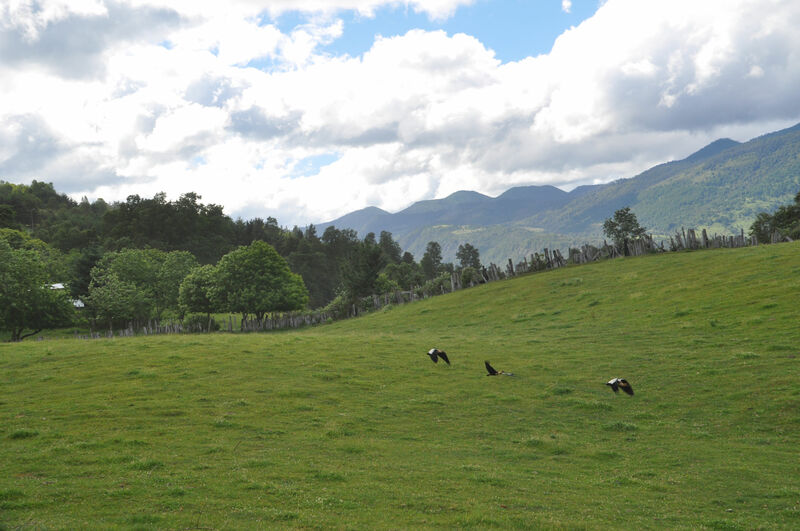 So imagine the most idyllic pastoral scenes: clipped grass slopes with sheep or cattle, eucalyptus trees fluttering in the breeze, little wooden cabins with lovingly attended landscaping. 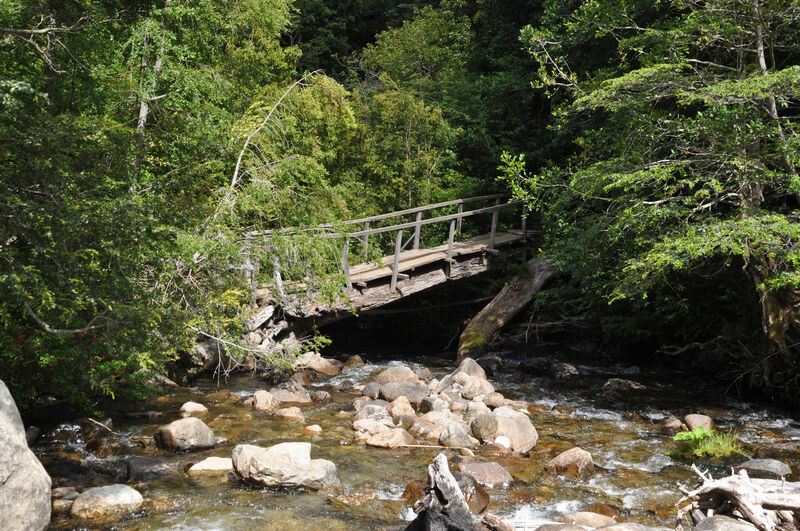 We crossed a creek on a wooden bridge, and finally struck out on the trail in earnest. 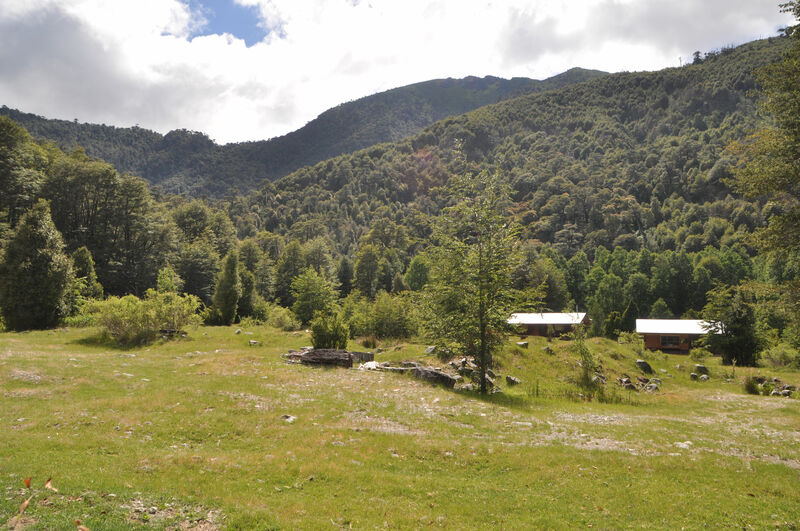 This is typical of the scenes we saw while walking along the gravel road part of the trail. The sheep had recently been shorn and I could see the marks from the clippers in their wool. 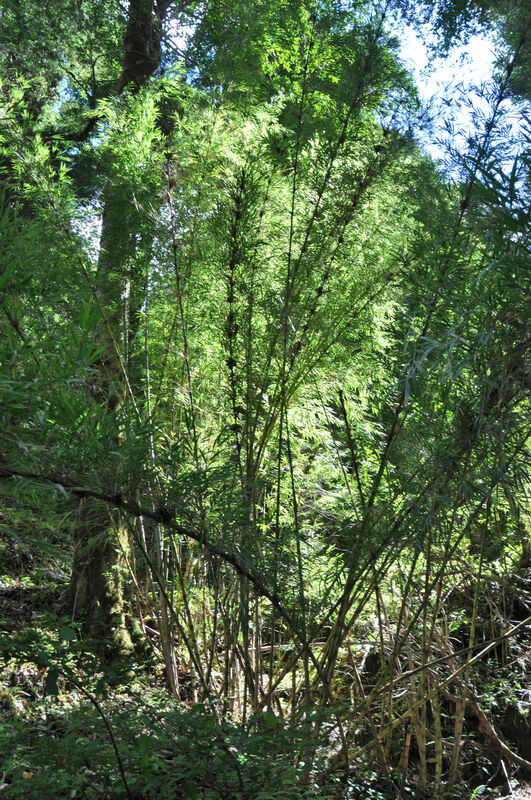 Bamboo was one of the primary trees in the forest, to our surprise. 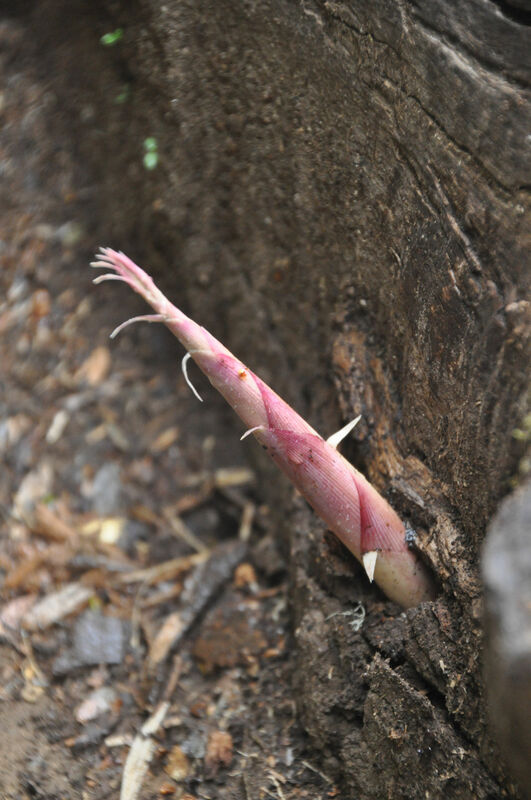 Baby bamboo sprout. Isn’t it remarkable? The climb was rather steep, and our breath was coming faster early in the hike. We made several switchbacks and were treated to multiple views of Lago Tinquilco as we climbed. Then, it began to rain. Lightly at first, and gradually, as the day progressed, it got colder and the rain became more insistent. We added all our layers of clothing and continued to climb. A trail to the side was marked, and we decided to head over to see the first Cascada (waterfall). 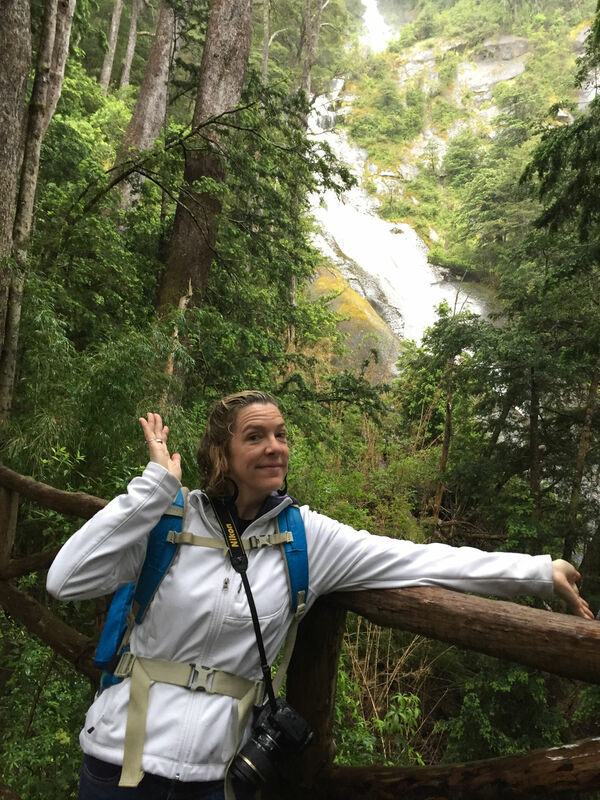 It was an impressive waterfall, and this is coming from a woman who lives in the Columbia River Gorge. 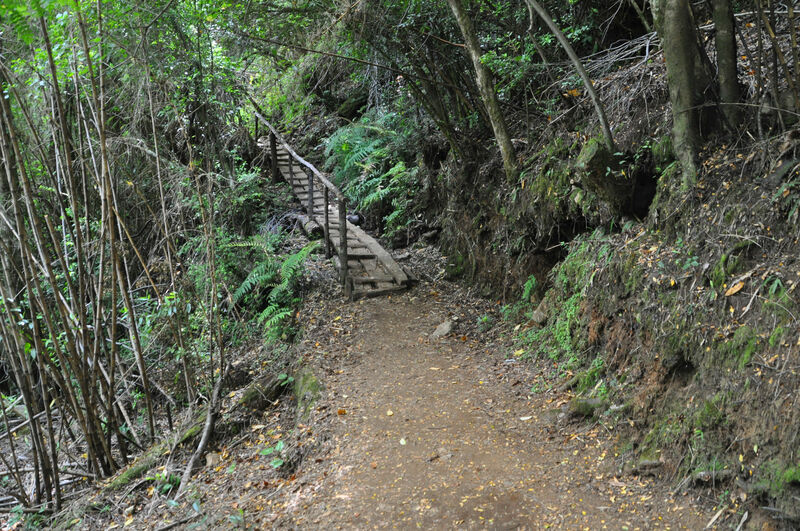 The trail included many little wooden structures to help us out, like bridges and ramps. A bridge over a river early along the trail. I took a photo of the map at the beginning of the trail, to help us navigate once we got up there. Cascada Eyrie, about 1/3 of the way to the three lakes. Just before the first lake we saw, the trail crested at about 4000 feet. 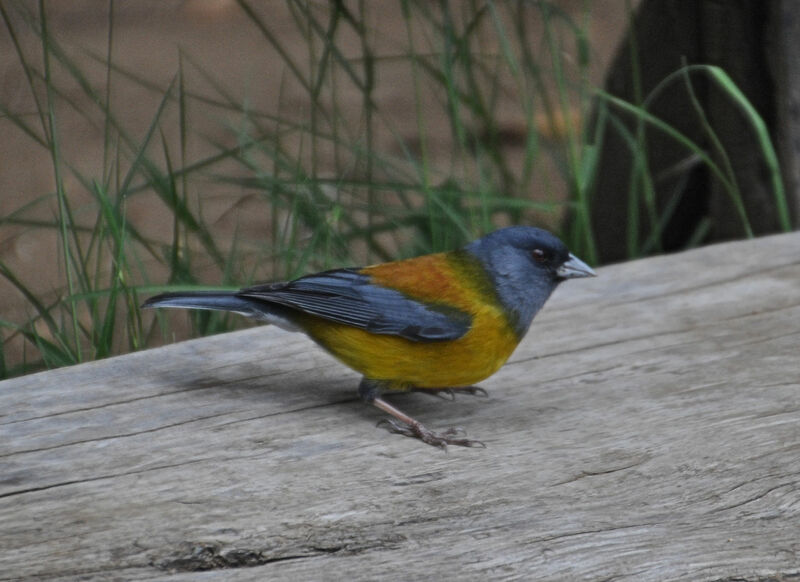 At Lago Chico we bumped into other tourists. These were from New Zealand. Soon after, we were passed by people speaking French, and later in the day, by a couple of guys speaking in a European language we couldn’t identify. At the waterfall earlier, we had too much fun jumping around the logs and taking photos of each other with a Chilean couple: none of us understanding a word that each other spoke, but still communicating just fine. Yesterday at the volcano we were taking photos with Japanese people who had also rented a car. Margaret said how much it felt like we were doing what traveling people do: since so many nations collided with our trip. 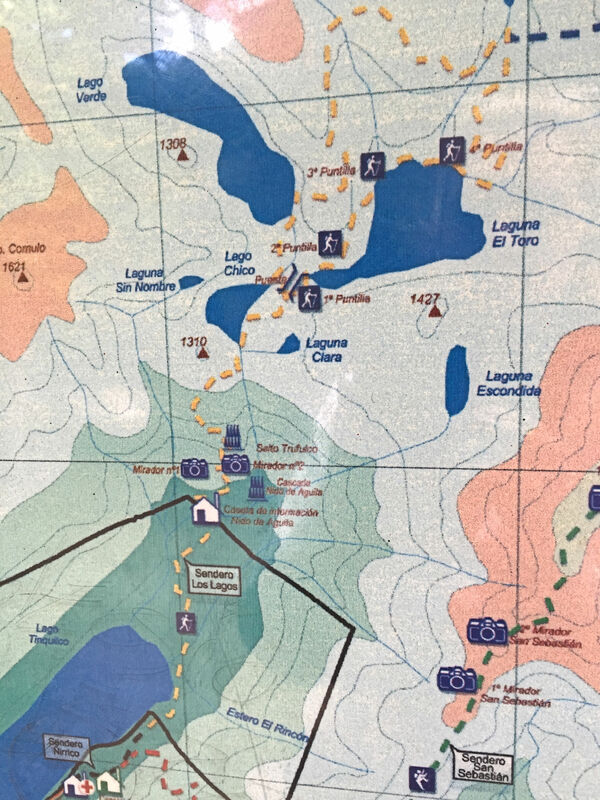 We had obviously made the same choice that many others make, and it’s kind of fun to discover that doing the Three Lakes Hike out of Pucón is a thing people do. As we spoke to the Kiwis, the wind started to pick up and the rain really began coming down. We were all getting pretty wet, and broke off talking in order to get along the trail. We ducked our heads against the worst blasts and made our way through the forest past Lago Chico. And we toughed it out as the rain lashed and the wind kicked up whitecaps on the lake. 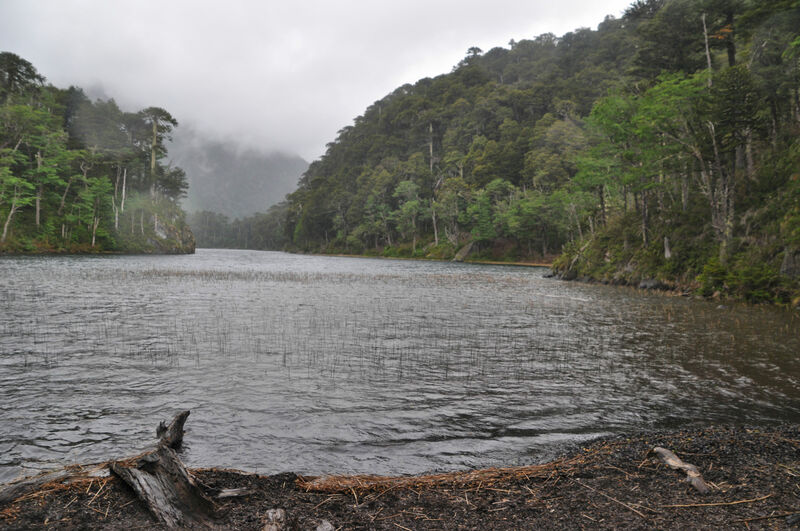 We arrived at Laguna Del Toro and wiped the water out of our eyes to see the cliffs across the lake, and saw that it was beautiful, and then we ducked our heads again, and hitched the sopping wet backpack a little higher. Lago Chico was very beautiful, and the weather almost added to the beauty of the view. 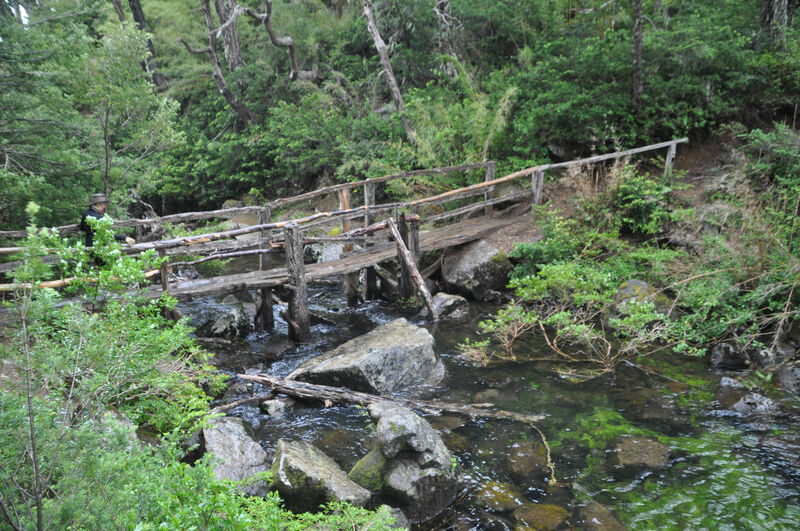 The bridge between Lago Chico and Laguna El Toro. Forest on the way to Laguna Del Toro. 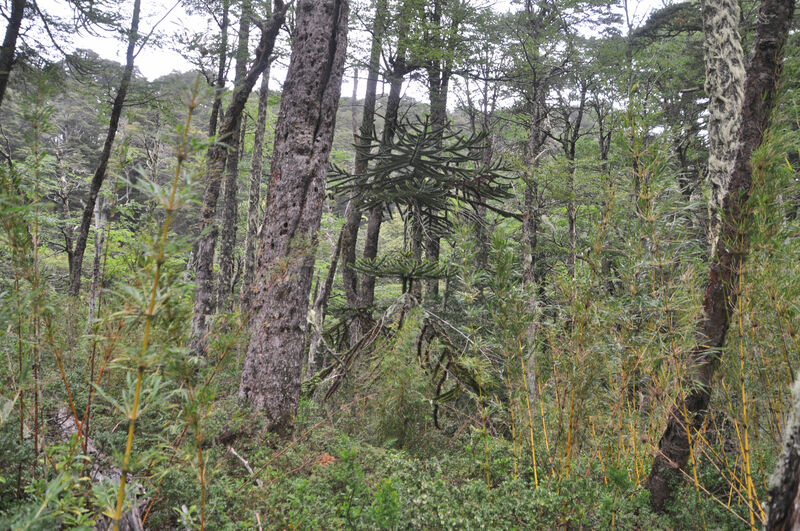 These are Monkey Tail (Araucaria) trees growing wild! 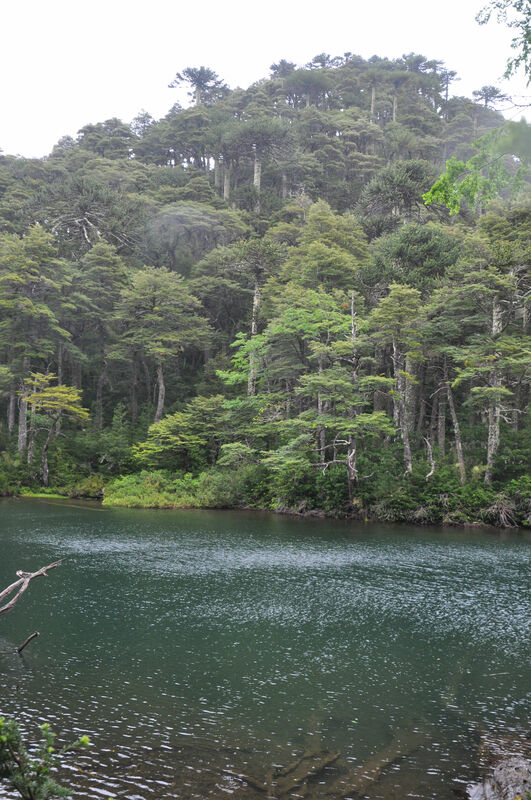 Laguna Del Toro in the pouring rain. At the junction for the third lake, we took 10 steps and then decided to bag it. I mean, really, what’s one more grey lake in the fog at this point? So we turned around and began slipping and sliding our way down the steep steep trail back to the car. Ok, yes, fine I’ll admit it, I did slip and fall and got red clay mud all over one sleeve of my jacket. Passing Lago Chico once more, watching the wind whip up little waves on the surface. I love that aqua green/blue colour of the water. “Oh! Oh my gosh!” Yelped Margaret. “Look at that, look!” But I was behind her and couldn’t see what she was pointing at, on the trail. 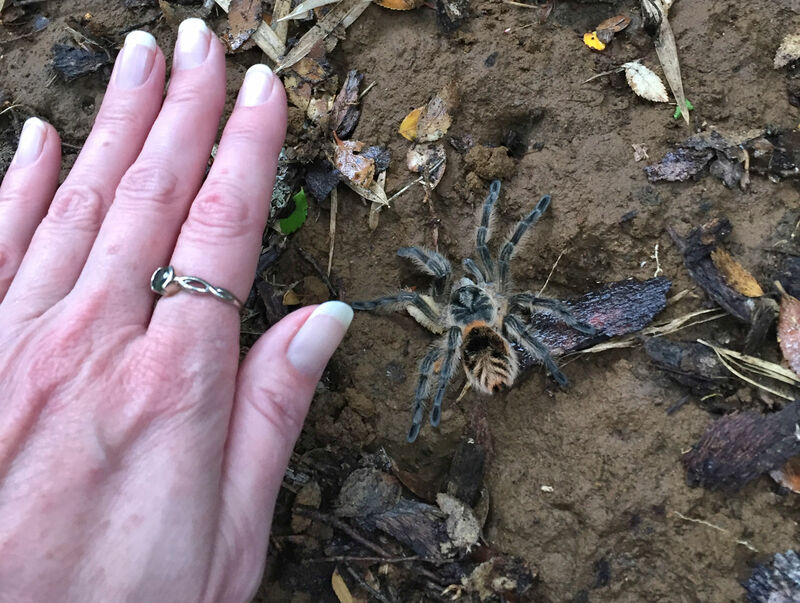 I peeped around her and saw the biggest, hairiest spider I have ever seen in the wild. I’d say this spider is sufficiently large. I wasn’t quiiittte brave enough to put my hand on the ground right next to it, so it’s slightly bigger than what it appears. 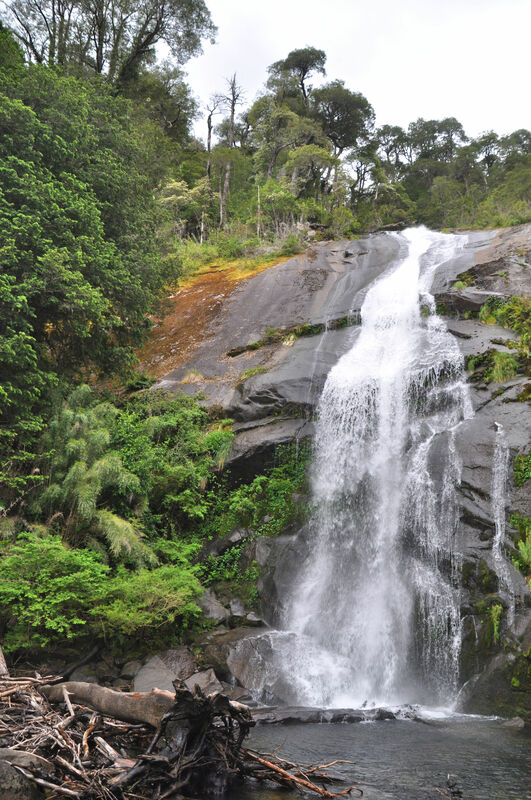 On our way back we took another side trail to Cascada Trufulco. You may be able to tell from the photo that I’m soaked to the core. If you can’t tell, just take my word for it. We were cold and hungry and tired. Our morning’s plan had been to make our hike last till suppertime, and to stop in Pucon that evening for dinner at a restaurant. We had a new plan: run in to the supermarcado at the edge of town, grab a bottle of wine, some water crackers and brie, and head for the hotel swimming pool. And that is exactly what we did. 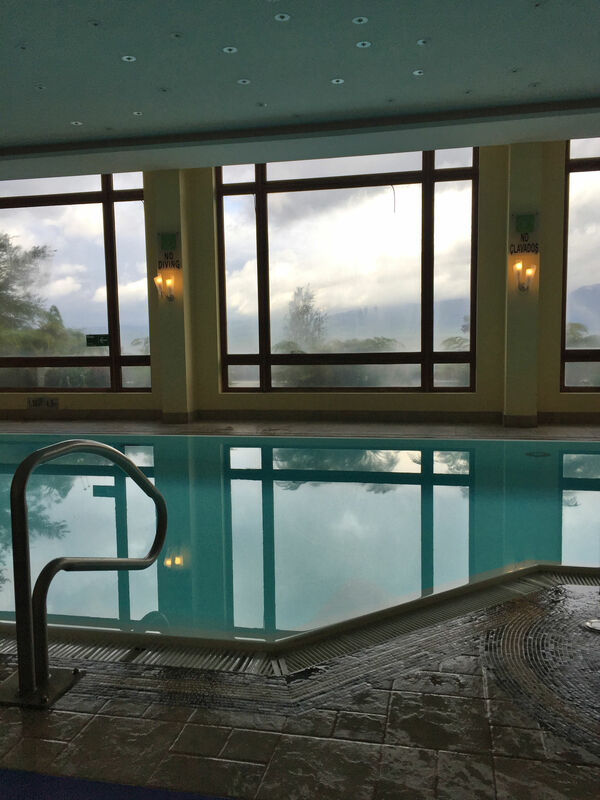 The heated pool was even more of a delight when afternoon rain turned into evening thunderstorms, and crackled and boomed while we swam and then ate cheese and crackers and enjoyed our wine.